Make a day of it! Celebrate John James Audubon’s birthday on Saturday, April 26, 2014 by viewing the naturalist’s art at the New-York Historical Society, visiting his gravesite and monument in uptown Trinity Cemetery and Mausoleum, and stopping by the Riverside Oval at 156th Street for a birthday party on the site of his former farm, Minnie’s Land. Begin the day at the New-York Historical Society on Central Park West and 77th Street, where you can see Part II of the grand three-year showing of all of Audubon’s original paintings for The Birds of America. 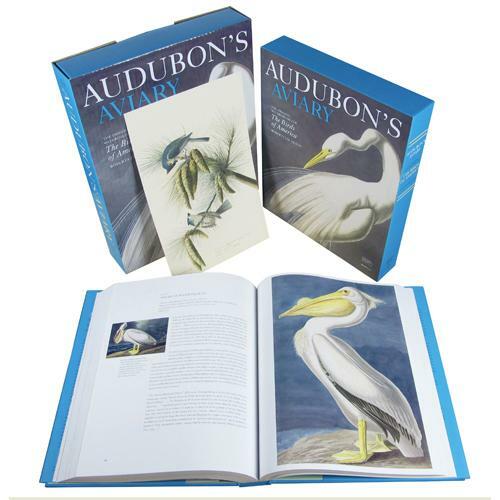 This installment, on display through May 26, 2014, is entitled Audubon’s Aviary: Parts Unknown and focuses on plates 176-305, many of which depict the brilliant plumage of water birds. The N-YHS opens at 10:00 a.m., so arrive early to have plenty of time to enjoy the exhibition. This once-in-a lifetime trilogy explores Audubon’s dazzling watercolors in the order in which they were engraved, affording visitors the unique opportunity to view them sequentially, like his original subscribers, and in their entirety. Audubon organized The Birds of America not by traditional taxonomic order, but according to his aesthetic and practical judgments. He believed this manner of presentation was closer to Nature’s own. Calls and songs of each species provided by the Cornell Lab of Ornithology, together with video footage, will demonstrate the importance of birdsong for species identification and underscore Audubon’s extensive field observations that animated his great work, The Birds of America. “Audubon’s Aviary: The Original Watercolors for “The Birds ofAmerica,” written by Roberta J.M. Olson with a contribution by Marjorie Shelley, and published by New-York Historical Society and Skira/Rizzoli, is a worthy complement to a visit – and for anyone unable to travel to the N-YHS, the next best thing to seeing the exhibition live. Among its awards are the Outstanding Permanent Collection Catalogue Prize of 2013 (by the Association of Art Museum Curators) and the 2013 Henry Allen Moe Prize for Catalog of Distinction in the Arts. In the early afternoon, leave the N-YHS and walk over Broadway and 79th Street where you can take the #1 train to 157th Street (about 25 minutes). Walk south two blocks to visit the Audubon monument in the Trinity Cemetery and Mausoleum. 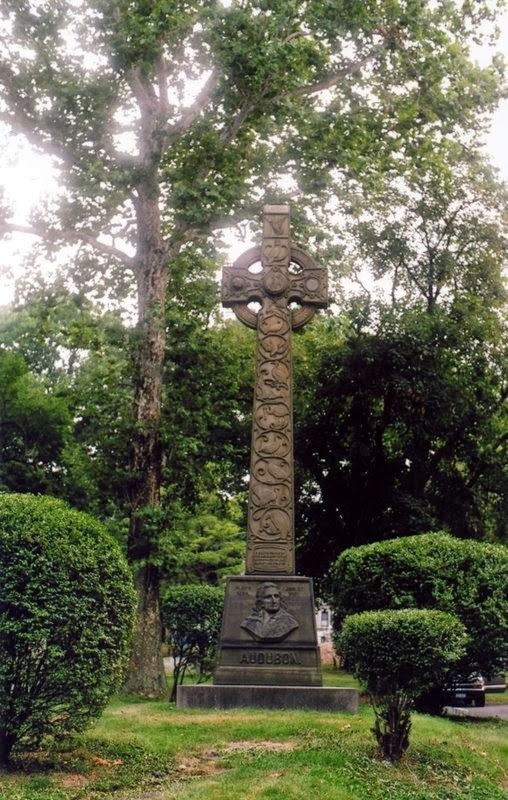 Facing the cemetery gate on 155th Street, halfway between Broadway and Amsterdam Avenue, the monument is one of the most popular sites in the cemetery and for many, an invitation to explore the only rural cemetery ever established on the island of Manhattan. 1) Of the fifteen people buried in the vault, three bear the name John James Audubon: the naturalist, his first grandson, who lived only one day in August 1842, and his second grandson, who survived to adulthood and died on March 6, 1893 – six weeks before the monument was dedicated. 2) Audubon’s first burial site was in the far southwest corner of the cemetery’s Westerly Division, in sight of the family’s home in Minnie’s Land. In 1888, when the New York Academy of Sciences conceived the idea for a monument honoring Audubon’s life and work, the members decided that the original vault – which was in danger of being disturbed by the grading and opening of 153rd Street – was too remote for their plans. As a remedy, the Trinity Corporation gave the Audubon grandchildren the 155th Street lot in exchange for the original one. 3) The Trinity Corporation donated extra land for the monument when it became clear that its weight would crush the family vault. Consequently, the monument sits on the vault’s northern edge rather than over it. 4) The primary reason for choosing this location was a plan for extending Audubon Avenue ten blocks south so that it would originate directly in front of the monument. On May 5, 1893, just a week after the dedication ceremony, the Panic of 1893 sent the U.S. into a depression, delaying many city projects, including extending Audubon Avenue south. Then, in 1898, just as the nation was emerging from the depression, the five boroughs consolidated into Greater New York. In the fierce competition for limited city funds that ensued, the planned extension of Audubon Avenue lost. Construction of North Presbyterian Church a few years later ensured that the merging of Audubon’s monument and avenue would never happen. 5) Audubon’s birthdate inscribed on the monument’s base is incorrect; though , May 4, 1780 is the date he often gave in his lifelong quest to obscure the circumstances of his birth. By a strange quirk of fate, the 1893 dedication ceremony occurred on Audubon’s actual birthdate: April 26. All existing evidence confirms that no one present was aware of that fact – not even Audubon’s grandchildren. As 3:00 p.m. approaches, cross 155th Street to the northern side and walk down the hill past the Audubon Terrace Museum complex. Turn right onto Riverside Drive and join the Riverside Oval Association in the Charles and Murray Gordon Park (“Riverside Oval”) for the fifth annual Audubon birthday party. Everyone is welcome to join members and friends of the association in a hearty chorus of “Happy Birthday” to Audubon. The party then moves to the Grinnell Community Room at 800 Riverside Drive and 158th Street for cake and a talk by Manhattanville and Trinity Cemetery historian Eric K. Washington, who will speak about the Audubons and Trinity Cemetery. Admission is free. Posted in 156th Street, Audubon Park, Audubon Park Historic District, Audubon's birthday, John James Audubon, Minnie's Land, N-YHS, Trinity Cemetery and Mausoleum. Bookmark the permalink.